Edward was born in Edinburgh, Scotland in 1983 – a true brave heart. He was an inquisitive little boy, loving life right from the beginning, and his sociability and genuine kindness were apparent straight away. At just 6 months old, baby Edward suffered a collapsed lung and had to be hospitalized. At that time, a sweat test for CF was negative and his lung issues were chalked up to asthma and allergies. This began a long road into the world of CF for our family. Edward’s often infinite patience was first tested at two years old, as he excitedly awaited the birth of his new little sibling. From the first day his sister Virginia was born, Edward was her protector and best friend. He was her hero, and she his unfailing sidekick, something that lasted until the end of his life. Ed was always active and busy, with true verve for life, but as he grew he continued to have problems with “asthma and allergies” and seemed unable to gain weight. Through all of this, he swam competitively and began playing rugby, along with any other sport he could. Living in Scotland on a farm offered a wealth of outdoor activities and adventures for Ed and his sister, and they spent as much time as possible out in the countryside breathing in the fresh air. At the age of 7, Edward caught a cold that quickly escalated, requiring him to be hospitalized. After a series of tests, he was diagnosed with CF. During that hospital stay, his condition became severe, and we were warned that Edward only had a few days to live. We discussed this with him alongside the doctors, and while his reaction was not typical for a 7 year old, it was certainly typical of Edward. He absorbed the information, and calmly raised three important points: (1) he was not going to die yet, because he wasn’t ready; (2) the doctors needed to tell him if he’d be able to grow tall, even with CF; and (3) would he be able to have children. Well, Edward was right, particularly with his first point – he was not ready to give up. That hospitalization, however, began a difficult stretch of years filled with health issues and learning about CF. Once diagnosed, Ed’s life became a cycle of 3 weeks in the hospital, and 3 weeks out. His sister spent every afternoon with him in the hospital after school, and when he was home he would spend his time on homework, swimming, rugby, and his friends. Edward had an insatiable thirst for learning and absorbed everything like a sponge. Despite his health issues and hospitalizations, he never missed a test or allowed himself to fall behind in school. He was truly a self-motivator, recognizing that if he was going to have a long and full life (which he desperately wanted), he would need to be successful in school. He really thrived both in school and in the pool, where he trained with his swim team for 3 hours per day, 6 days a week. This commitment was not only a commitment to his team, but a commitment to his health, knowing that exercise was the key to breathing easier. Edward would wake up an hour earlier than his sister so he could handle all of his treatments, and then they would head to morning practice. He never complained – it was just what he did. Once our family moved to the U.S. from Scotland, Edward was able to stay out of the hospital and manage his health very well. During this time, he continued to excel in swimming and at school, and also took up baseball to “become more American.” Many of his friends in high school were not even aware that he had CF – he wanted to be a normal, happy, healthy teenager, and luckily for the most part, he was. Plus, all of that achievement aside, Edward was a true, fun friend, who was kind, loyal, and certainly loved a good party (as many of his friends would tell you)! From an early age, Edward managed his treatment himself as best he could. He was extremely involved and proactive, and his experience with CF gave him an early interest in science. He recognized the importance of being vocal, communicative, and working well with his medical team, and he challenged his doctors at every step to ensure that the best protocol for his health was found. That early interest in science spurred Edward to Clarkson University to study chemistry (he received his B.Sc. with highest honors in 2004). He swam on the NCAA team throughout college and captained his team during his junior and senior years. A few things remained constant for Edward during that time in his life – his academic and athletic success, his close bond with his sister, and his valuable friendships. Unfortunately, his health did not remain so constant. Ed was frequently required to do IV medications while away at school, and ultimately decided to ditch the PIC lines for a permanent port, so that his regiment would not interfere too much with the rest of his life. He looked on the bright side – his frequent trips to the hospital in Albany may have taken him away from school more than he would have liked, but it allowed him to be one of the few underclassmen at Clarkson to have a car and a prime parking spot! Edward stayed on at Clarkson to study for his MBA, while making plans to pursue his PhD in Chemistry at Columbia. CF interrupted these plans, though, forcing him to return home to deal with his health issues. This was the first time in Edward’s life that he felt he had to “give in” to his disease – and he did not like it. Trips to Mount Sinai Hospital in NYC followed, where he was listed to become a recipient of a double lung transplant. Throughout this time, Ed continued to be active, logging whatever time he could in the pool, and coaching the local high school girl’s swim team from the deck. He also continued to work in science by working in a local lab – he felt strongly that he couldn’t let his skills become stale. 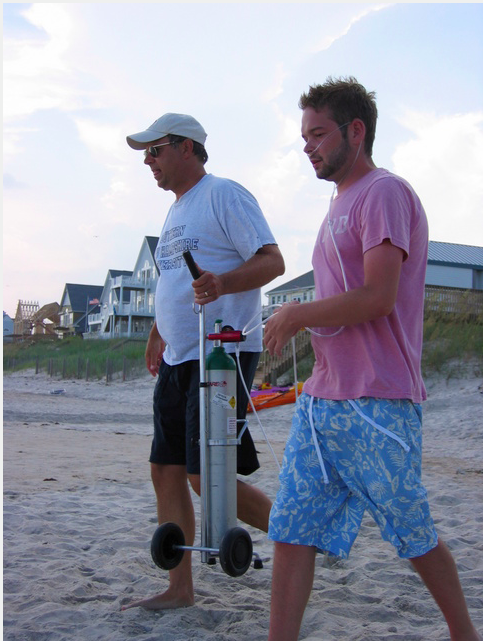 During the last summer of Edward’s life, 2005, he required an oxygen tank most of the time. Of course, he demanded portable options, nicknaming his mini hip pack tank “Buddy.” This still didn’t stop him, though – Edward and his sister spent as many afternoons as they could hitting the driving range and even just putting golf balls around the yard. They spent much of this time dreaming about finding a cure for CF, and starting their own charitable foundation. They wanted other CFers out there playing golf, swimming and enjoying life as much as Edward did. Very sadly, Edward lost his battle before they could turn that into a reality, but his sister and his friends are now working to make that dream come true. During his last few months, Edward often wondering what his purpose “here” was. He talked a lot about this with his family… well, here we have a wonderful charity known as Coach-Ed. We believe that’s what his purpose was and is, and that a Coach is what he truly was. He was a coach to us in all aspects of life – teaching us how to live beyond any limitations, find our passion, and to bravely face it all with an open heart. Edward fought for his life, every second, right up until the end. He never complained – truly! – and was almost always laughing, joking and making new friends. One of his favorite catchphrases was “outstanding!” and it really sums him up – he was an outstanding son, brother, friend and young man. He never wasted any part of his life, loving his time here with us and loving everyone in his world with all he had. It was truly a privilege to be his family, and it is a privilege to build on his dreams with Coach-Ed.